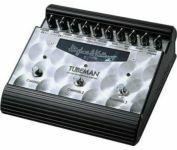 The H&K Tubeman is a floor guitar preamp. It has 3 channels - Clean, Crunch and Lead, all footswitchable with its own dedicated switch. All 3 channels share the same eq controls and master volume control. The unit houses one backlit preamp tube (12ax7) which according to H&K injects some non-linearity (analog feel) to the sound. There is one guitar input unit on the amp and 2 outs - one is a mixer (speaker emulated) output while the other one is for use with a guitar amp. The unit is housed in a roadworthy metal case that looks like it can take some beating and still perform well. The H&K comes with an included proprietary power supply and cannot operate on batteries. I've found that the H&K has some great sounds - from clean country and ballad to mild and rock overdrive to some searing metal tones, all in one box and at the tap of a switch. The clean channel is pretty much whatever they've given you - all you can control is its volume. Although, it doesn't have a lot of control features it sounds as it says, in other words, clean. It is very useful for some chord work or a clean ballad solo. The Crunch channel goes from mild bluesy overdrive when the Gain is low to some more aggressive rock tones, close in sound to something like the rhytm work in AC/DC albums. The Lead channel is the star of the show - it roars like James Hetfield or gets smooth like a Santana solo. When the Gain is more backed up in can get close to sound to the Crunch channel. Increasing the Gain can put you in metal territory. The Contour switch is something akin to a Marshall Presence control - it controls the amount of bite in the mid frequency. The H&K has designed this pedal mainly for the home studio recordist so they've put their famous Redbox amp/speaker sim technology in the mixer output on this pedal. I can say that it is probably the closest in amp simulation that anything hardware has gotten to the real thing. The other output of the Tubeman can go to a guitar amp so this pedal also feels good on stage. You can think of it as becoming a three channel preamp when in that capacity. A setback in this situation is the lack of full bypass switch - you cannot turn it off as it has to be always on. Another small minus for me was the fact that it comes only with one dedicated eq that controls the whole unit. I didn't find this as bad because usually most of the sounds worked well with one eq and the Contour switch on the Lead channel is so well designed that you don't really feel this box lacking in the eq department. The eq itself is responsive and very well voiced. Another aspect of the design that seemed a bit strange was the use of a proprietary power supply. In this case if you lose it while you're going to a gig or leave it at home on your way to the studio you're pretty much in trouble. I am sure H&K would be happy to sell you another one but it could definitely be a problem if you need to use your Tubeman right away. I think the main thinking behind the proprietary design on the power supply was the fact that it runs the juice slightly hotter at 12 volts instead of 9 volts probably because of the included tube. Again - not really an excuse because Radio Shack also sells power supply that goes all the way up to 18 volts! Another thing that is a bit strange is that the guitar input on this box is on the back left hand side making it a bit harder to incorporate into a pedalboard. This pedal overall screams quality and versatility, and it should considering its price. It is not cheap but you definitely get the signature H&K sound for a fraction of their amplifier price. As far as direct competition I can see the Sansamp TRI-AC as a close contender for half the price but it cannot dish out as much gain as the Tubeman, yet has 3 preamp voicings opposed to H&K's one.